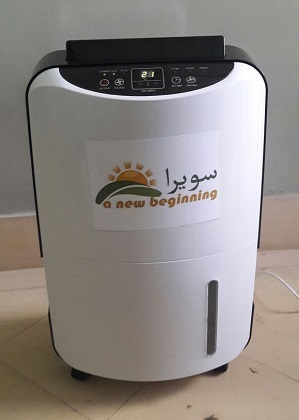 It can be seen that the start-up power of the dehumidifier is within the value specified by the manufacturer. Once the system is running, power draw will vary, but with blower and evaporator fan running, as well as the compressor motor, the power consumption is 15% lower. 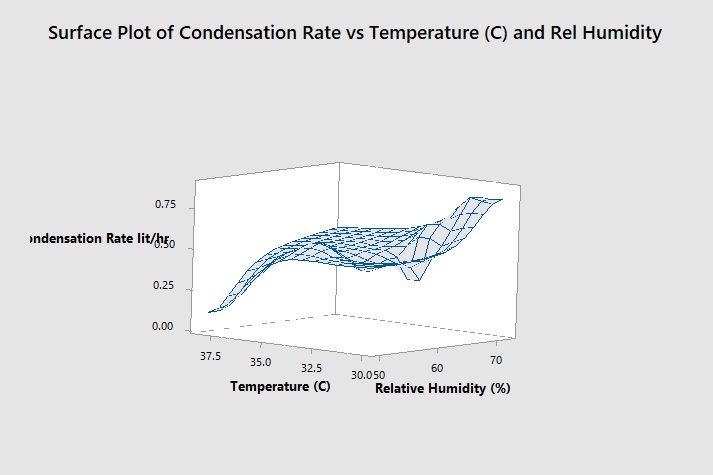 This value will vary based on ambient conditions, and how hard the condensation cycle has to work. 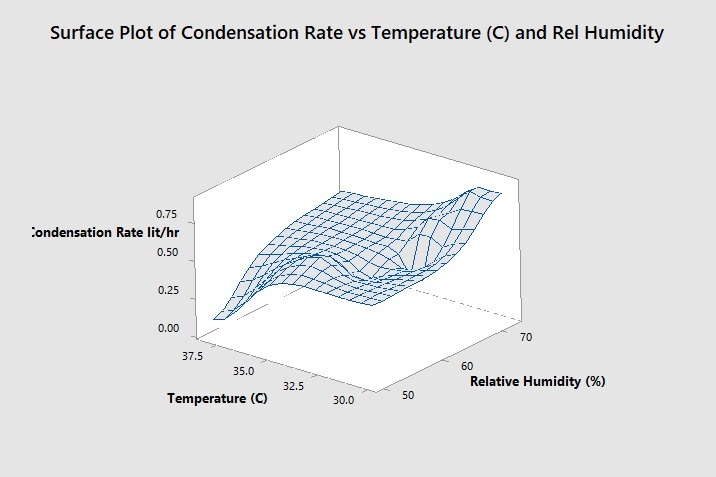 And, if the results are plotted against the ambient temperature, the trend of decreasing condensation rate with increasing temperature which suggests that the results are not as sensitive to temperature in range 30C to 38C, but more sensitive to the relative humidity. Note that the graph plots the average of Test number 2 and Test number 6 for 32C. 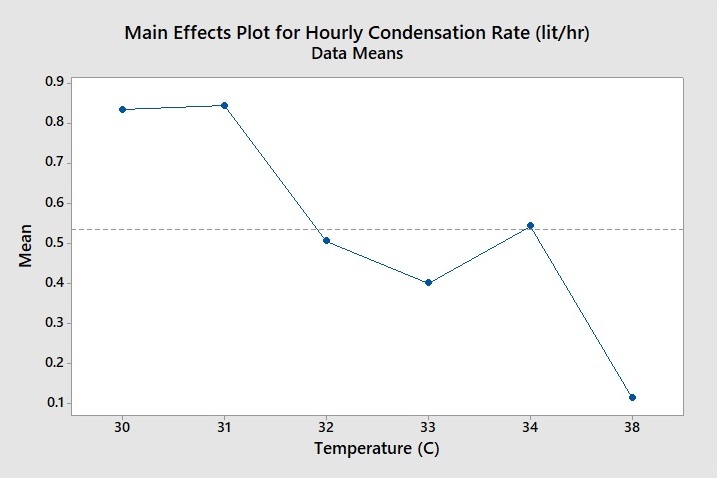 Similarly, the condensation rate for Test number 4 and Test number 8 is averaged out. 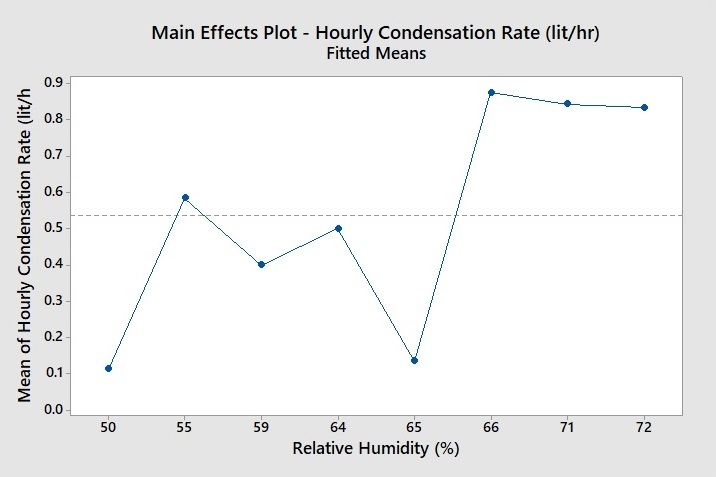 Since moisture content increases with temperature, the graph below, underscores the importance of relative humidity. The plots also flag the condensation rate for Test number 2 and Test number 5 at 0.14 liters/hr and 0.11 liters/hr being at odds with rest of the data. Our initial suspicion was to ascribe the low condensation rate to possible system shutdown due to low power from panels/batteries. However, Tests number 9 through 11 with grid power show a similar pattern .. a condensation rate of 0.83 liters/hr for Test number 10 at the same approximate values of temperature and relative humidity as Test number 1, 3 and 6. And a condensation rate of 0.17 liters/hr in Test number 11 (i.e. 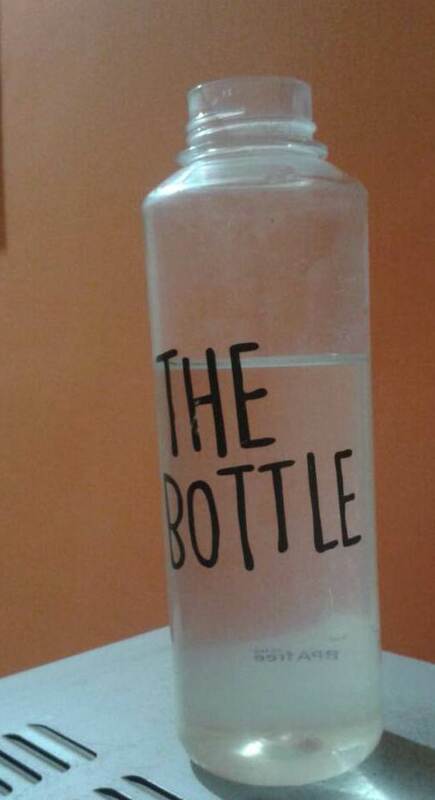 similar to Test number 2 and Test number 5), even though the operating conditions are virtually identical to Test number 3, where a condensation rate of 0.84 liters/hr is obtained. Finally, we obtain a condensation rate of 1.33 liter/hr at the highest value of relative humidity across all eleven tests, at a value of 75%. This is very encouraging, as we only need about 5 hours of solar powered operation from the system to get 6-7 liters of water. Next Steps The team needs to figure out the reason for the very low condensation rates of around 0.14 liters/hr, looking at possible malfunction of dehumidifier, dehumidifier settings, noise factors such as air flow is partially blocked, errors in measurement of temperature or humidity etc. We also need to establish the longest duration the system can run on solar power, and the time of the day (or night) when this run should be performed.